If the ear accepts it, that's it! You can iconoclastically set those rules to the side. 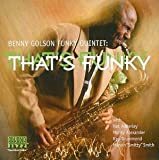 Benny Golson, tenor saxophone stylist and jazz composer of first rank, refuses to rest on his laurels. At almost 80, he's an elder statesman of jazz who could easily cruise and live off the royalties of "I Remember Clifford," "Whisper Not," "Along Came Betty" and others among his 300 compositions. But such a notion is anathema to him. "At this late date, I still find music to be an adventure. There are things that I haven't done yet. I don't want to look at what happened, I want to look at what's coming up. When I wake up, I intuitively ask myself, what can I discover today that I didn't know about yesterday? That makes it an adventure. And jazz is all about improvisation. Nobody comes to hear the melody chorus after chorus; after the melody, they want to know what you've got on your mind. What is your impression of this tune? What feelings do you get from it?" 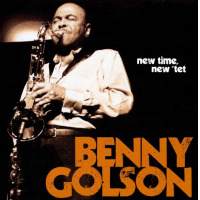 Listening to Benny Golson speak, whether waxing philosophical or musicological, sharing hilarious stories or recounting difficult periods, induces feelings quite similar to those his tunes evoke. He's dignified, eloquent and melodic and evinces a graceful humility and down-to-earth manner. He's one of the nicest guys you could ever meet. 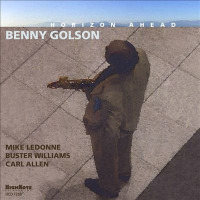 But according to his long-time pianist Mike LeDonne, Golson's modest demeanor belies the fact that he's also a genius. These attributes of spirit, mind, and voice were honed in Philadelphia, where Golson was born on Jan. 25, 1929. He began playing piano at nine, desiring to become a concert recitalist. But at age 14 he heard Texas-born tenor saxophonist Arnett Cobb perform "Flying Home" with the Lionel Hampton Orchestra and the piano began to pale. His mom, always supportive, had financed his piano lessons and when he asked for a sax, she obliged, paying by lay-away. By 16, he was participating in practice sessions with other notable jazz apprentices of his generation: pianist Ray Bryant, trumpeter Johnny Coles and saxophonists Jimmy Heath and John Coltrane. Many of those sessions took place in Golson's living room in Philly. On one occasion, he and Coltrane were listening to Dizzy Gillespie and Charlie Parker records after being told that their gig had been called off...an hour-and-a-half before the hit. Sure enough, the lads discovered that their spots had been taken. "We walked home and John says, you were right, Ms. Golson. She saw we were in such pain that she came over and squeezed us and said, 'Don't worry baby, one day you all will be so good that they won't be able to afford you.' We didn't believe it. "Years later, we're playing at the Newport Jazz Festival and John was in the tent warming up on his soprano. He had just recorded My Favorite Things (Atlantic, 1960) with his quartet. 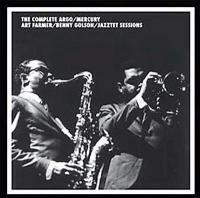 And Art Farmer and I had formed the Jazztet. Suddenly he took the horn out of his mouth and started laughing. He said, 'Remember what your mother told us? Well those guys are still in Philadelphia and we're here!" 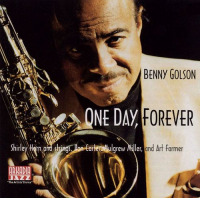 After high school Golson attended Howard University in Washington, DC, where, in the late '40s, jazz was not tolerated. He couldn't even play his saxophone at the audition, only clarinet and piano. In less than three years he left Howard in disgust. (Ironically, Howard honored him a half century since and has established a scholarship in his name.) He had already begun to compose and his attitude about the musical rules his teachers were trying to impose was, "Well, can't you break the rules if that helps you accomplish what you're trying to achieve?" One of his most famous songs, "Killer Joe," is a prime example. (The title of the song refers to a composite of various pimps Golson witnessed in the major cities to which he traveled.) Unlike the common five (dominant) chord to one (tonic) chord progression, "the dominant didn't go back to the tonic. I went from the sixth to the tonic. Now, everybody knows that tune. If the ear accepts it, that's it! You can iconoclastically set those rules to the side." He left Howard University, moved back to Philly, got married to his first wife and worked music gigs on the weekend. During the week he drove a truck and even got a job in a lampshade factory for extra money. Benjamin "Bull Moose" Jackson, an R&B singer and saxophonist, brought his band to town and needed a sax man. 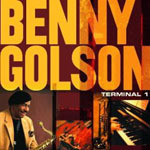 Golson began touring with the group, which had pianist Tadd Dameron, drummer Philly Joe Jones, trumpeter Johnny Coles and bassist Jymie Merritt (whom a few years later Golson brought into Art Blakey's Jazz Messengers along with fellow Philly men Lee Morgan and Bobby Timmons).